Como Bluff area in southeast Wyoming. Dinosaur quarry locations shown by yellow dots; Como Bluff quarry locations shown by yellow ellipse, train stations shown by green triangles; old Union Pacific route by track symbol; historic features by red stars; towns by red (active) and green (abandoned) dots; hydrocarbon fields green (oil) and red (gas); wind farms by white stars; reverse faults by red line with sawteeth on upthrown block; anticlines by white dashed lines. 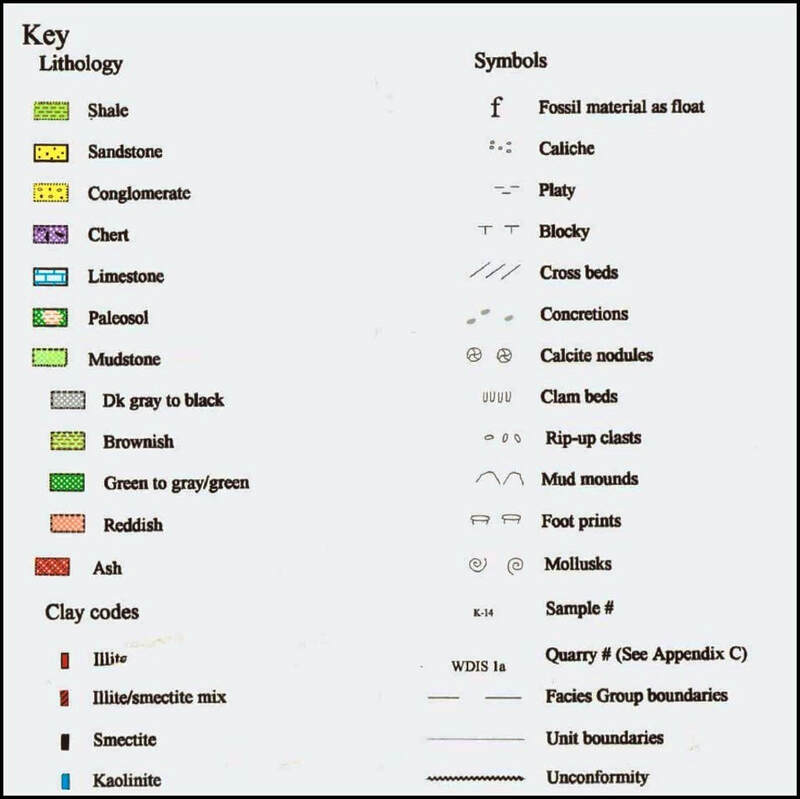 Image Data: Ostrom, J.H., 1970, Mesozoic Vertebrate Paleontological Sites for Possible Inclusion in the Registry of Natural Landmarks; http://npshistory.com/publications/nnl/mesozoic.pdf. The Cheyenne name for the region drained by the Medicine Bow River is “good medicine for the bow.” The phrase is a reference to the excellent hunting found here. French fur trappers shortened the name to Medicine Bow. The name was given to the mountains to the south, and to the river that carves northward through the Laramie plains. It was also given to a small freight station on the Overland Trail/Fort Fetterman wagon road. Medicine Bow became an important location in the settlement to Wyoming. Five miles to the east, at Como Bluff Anticline, was an area that was important to a large community of dinosaurs who traversed the riparian Morrison landscape about 150-155 million years ago. The Medicine Bow/Como Bluff area gained worldwide fame for its dinosaur skeletons, the notoriety of the Bone Wars and was added to the National Registry of Historic Places in 1973. Como Bluff, Albany and Carbon Counties, Wyoming. 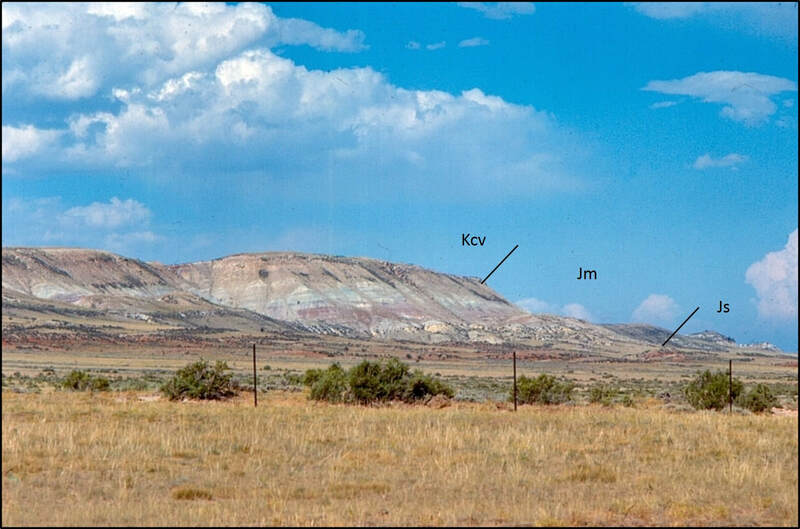 Abbreviations: Kcv: Cretaceous Cloverly Formation, Jm: Jurassic Morrison Formation, Js: Jurassic Sundance Formation. Image: After Anky-man, 2007; https://commons.wikimedia.org/wiki/File:Como_Bluff.jpg. In March of 1877, William Harlow Reed was returning home from an antelope hunt when he discovered large animal bones along the north side of Como Bluff anticline. Reed, the station foreman at Como Bluff, engaged William Edward Carlin, station agent, to explore the discovery. They concluded that this was a dinosaur bone bed. These would be the first saurian remains discovered in the western United States. It is remarkable that two other Morrison bone beds were discovered that same month in Colorado: Garden Park north of Canon City and the Lakes quarries near Morrison. Only two dinosaur skeletons had been previously discovered in America, both in east coast states (New Jersey and Pennsylvania). The science of dinosaur paleontology was new and the competition for discovery and collection for eastern museums was intense. 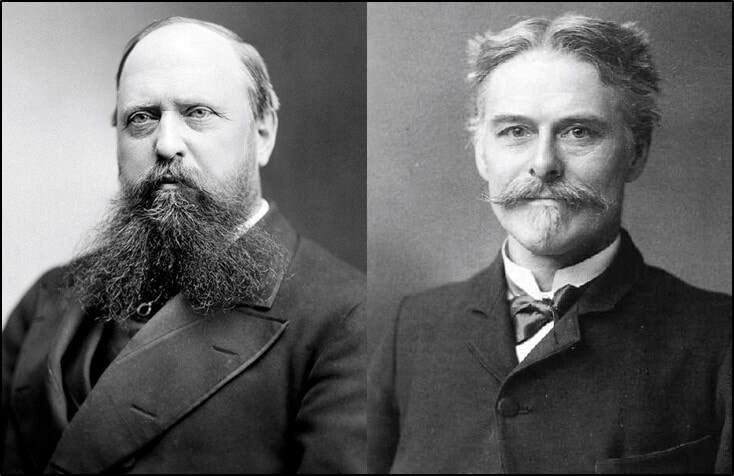 None more so than the bitter feud that developed between Edward Drinker Cope (Academy of Natural Sciences of Philadelphia) and Othniel Charles Marsh (Peabody Museum of Natural History at Yale). Their rivalry is known as the Bone Wars. Their collecting team antics included bogus fossil salting, spying, gunfire and dynamite explosions. A frequent claim is thatMarsh named fossilized droppings “coprolites” to forever associate his rival, Cope with dinosaur dung. Unfortunately, this story is apocryphal. Although their collective work increased the knowledge of Saurian vertebrates, their lack of professionalism is a low point in American Paleontology. The “Great Rush,” as this feud was also known, conveys the often hurried, poor techniques used in the field. The Marsh-Cope Dinosaur rivalry that extended from 1877 to 1892 reached beyond Como Bluff to other dig sites in the American West. Dinosaur remains recovered during this “war” were shipped from Medicine Bow Station (now home to the Medicine Bow Museum). The bones collected by the paleontological teams made Como Bluff world famous for the volume, diversity, and preservation of Sauropods (the largest creatures that ever walk on the planet), Theropods (the carnivorous predator Allosaurus), and Orinthischia (like the herbivorous quadruped Stegosaurus). Como Bluff specimens are on display atthe Peabody Museum at Yale, the Smithsonian Institution’s National Museum of Natural History in Washington, D.C., Carnegie Museum in Pittsburgh, and the American Museum of Natural History in New York City. Dinosaur types (clades) found at Como Bluff (not to scale). Image: Sauropods, Theropods, and Orinthischia: After http://segalainfo.com/sauropoda/and Wikipedia; Pterosauria: After Foster, J., 2007, Jurassic West: The Dinosaurs of the Morrison Formation and Their World, Fig. 5.27, p. 157. Medicine Bow Station evolution. Left Medicine Bow railway depot, 1907. Right: Medicine Bow Museum and Visitor Center, 2014. ​The original Union Pacific railroad track (note location by track symbol on the first, and close images of the area) followed the valleys of Rock Creek and Medicine Bow River eastward of the planned route. Consulting engineer Silas Seymour selected the alternative route without informing Grenville Dodge the Union Pacific’s Chief Engineer. The added 20-mile path was viewed by an angry Dodge to be padding the bill for profit. At the rate of $48,000 per mile, the increase was almost a million dollars. Seymour believed the alternate route would require less grade and leveling work for construction and save time and money. The Board agreed with Seymour. The Union Pacific abandoned the Seymour route in 1909 in favor of the present route along the west side of U.S. Route 30. In 1910, they opened a new train station at Rock River. 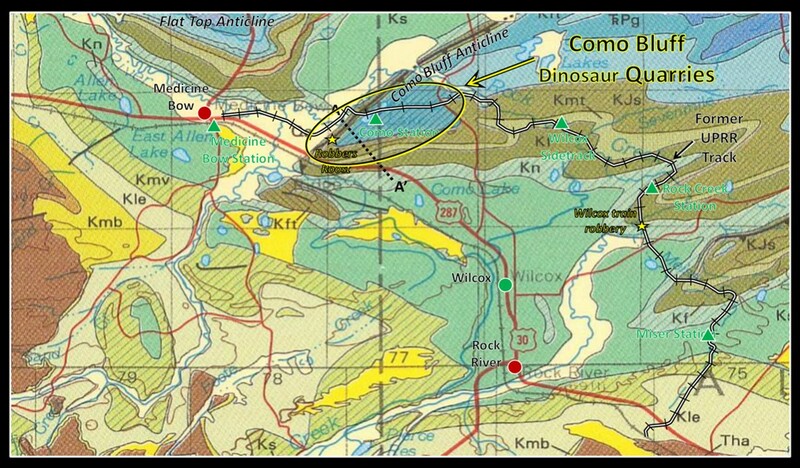 The Union Pacific Seymour route extended from Medicine Bow across the nose of the Como Bluff anticline through Como Station and Wilcox Sidetrack. The route turns south heading through Rock Creek and Miser Stations, crossing U.S. 287 near highway mile marker 296. Note that if Dodges Route had been used Como Bluff and Medicine Bow would have been bypassed. Image: After Cronberg, M., 2015, Good Medicine for the Bow: A History of Medicine Bow, Wyoming (Kindle Version), Fig. 9, p. 53. The name Robbers Roost was applied to an area at the northwestern nose of Como Bluff Anticline. Apparently, the name was given due to the number of outlaws practicing their trade in the area. On June 2, 1899, Butch Cassidy’s Wild Bunch pulled off Wyoming’s largest train robbery (about $50,000). The heist is known as the Wilcox or Rock Creek train robbery and was featured in the movie Butch Cassidy and the Sundance Kid. The dynamited baggage car of the Wilcox Train Robbery, 1899 (Left) and gentlemen of the Wild Bunch that committed the crime in full sartorial splendor, 1900 (Right). Front row left to right: Henry Longabaugh,alias the Sundance Kid, Ben Kilpatrick, alias the Tall Texan, Robert Leroy Parker, alias Butch Cassidy; Standing: Will Carver & Harvey Logan, alias Kid Curry (Fort Worth Five Photograph). Image Left:http://genealogytrails.com/wyo/johnson/holeinthewall.html, Right: John Schwartz, 1900, the Fort Worth Five Photograph, https://commons.wikimedia.org/wiki/File:Wildbunchlarge.jpg. 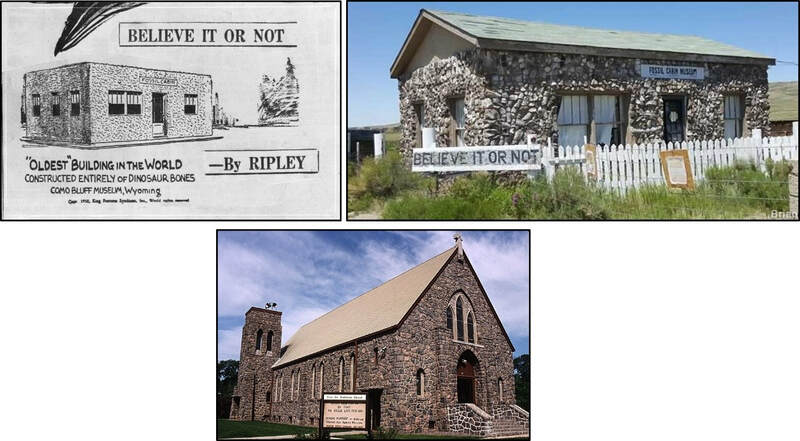 At mile marker 279 is the original location of the Bone Cabin, that Ripley’s Believe It or Not called the oldest building in the world. The Bone Cabin is built entirely from almost 5,800 Jurassic age (146.8-156.3 million years) dinosaur bones collected from the Como Bluff area. Ripley’s antiquity claim, based on the age of the building materials, is easily disproved. Zion Lutheran Church in Morton, Minnesota is built from Archean age (3.5 billion years) Morton Gneiss and began construction in 1939. Ripley’s claim was off by well over 3 billion years. The cabin, Como Bluff, and the Bone War made this a very popular attraction for travelers on the Lincoln Highway, the nation’s first transcontinental roadway. The cabin was added to the National Registry Historic Places in 2008. The cabin was moved in 2019 to the grounds of the Medicine Bow Museum, formerly the railroad where Como Bluff dinosaur bones began their journey out of the state. 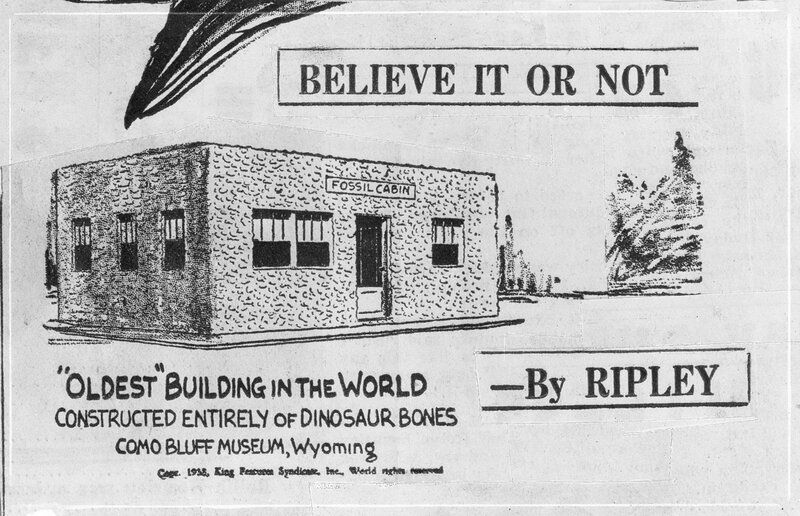 Top Left: Ripley’s 1935 antiquity claim for the Bone Cabin. Top right: Cabin built as a tourist roadstop in 1932 and closed in 1992. The oldest Como Bluff dinosaur bone in the cabin is 156.3 million years old. Bottom: Lutheran Church in Morton, Minnesota built entirely of Morton Gneiss. The oldest rock in the church is 3.5 billion years old. This makes the church 3.3 billion years older than the cabin. ​Como Bluff is a west plunging asymmetric anticline that extends 24 miles from the west flank of the Laramie Mountains. The fold is bound on the north flank by a south dipping reverse fault. The fault is aligned with the 1.76 Ma Garrett-Fletcher shear zone that separates Archean age granite and gneiss terranes in the Laramie Mountains. The Proterozoic age Cheyenne Belt Suture influenced the basement fabric of the latter Laramide compressive folding and faulting in the northern Laramie Basin. Como Bluff and Flat Top Anticlines have Phanerozoic rocks folded around faulted basement cores. They are the structural boundary between the Shirley (north) and Laramie (south) basins. The Flat Top Anticline just north of Medicine Bow is an example of an exhumed oil field with oil-stained Tensleep Sandstone outcrops. Precambrian basement structure map of the Como Bluff Anticline in southeast Wyoming. Abbreviations: CB: Cheyenne Belt, CBA: Como Bluff Anticline, FTA: Flat Top Anticline, G-FSZ: Garrett-Fletcher Shear Zone. Image: After Blackstone, D.L., Jr., 1993, Precambrian basement map of Wyoming—Outcrop and structural configuration: Geological Survey of Wyoming [Wyoming State Geological Survey] Map Series 43, scale 1:1,000,000, http://sales.wsgs.wyo.gov/precambrian-basement-map-of-wyoming-outcrop-and-structural-configuration-1993/. 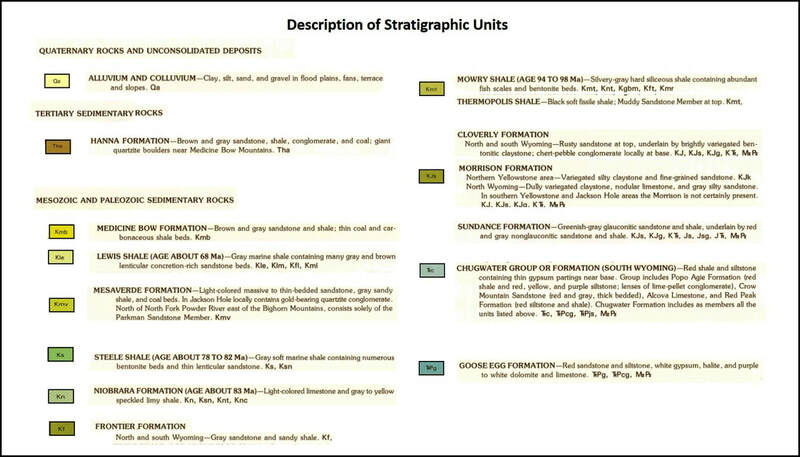 Geologic map of Como Bluff area and stratigraphic description of units. 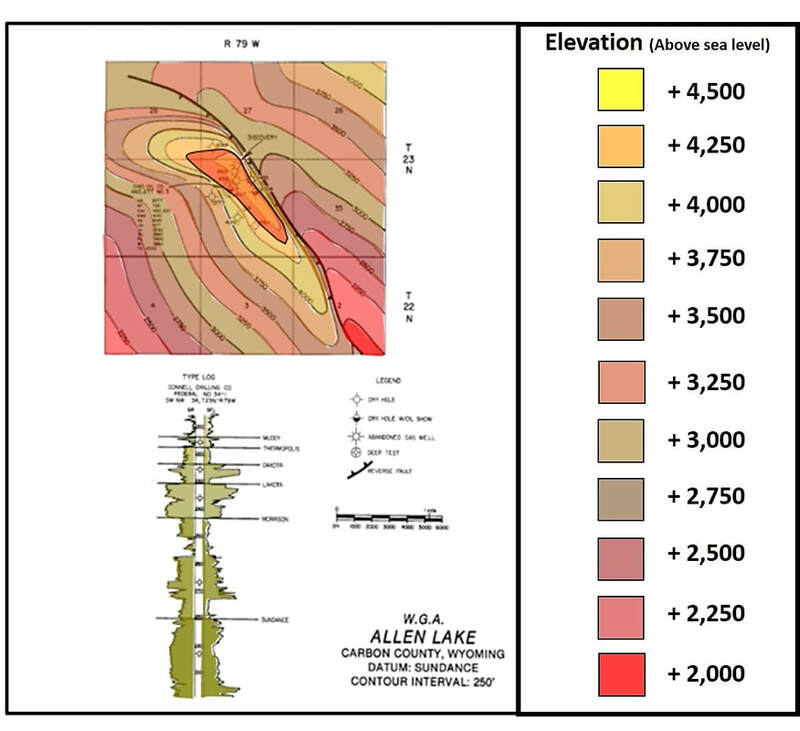 Geologic cross section of Como Bluff. Vertical fault separation on the basement is 4,000 feet. The bluff average elevation gain is 7,120 feet. Maximum relief in the area is about 400 feet; horizontal distance is about four miles. Rectangle shows area of Morrison – Sundance lithologic stratigraphic cross section. Image: After Mears, B., Jr., Eckerle, W.P., Gilmer, D.R., Gubbels, T.L. Huckleberry, G.A., Marriott, H.J., Schmidt, K.J., and Yose, L.A. 1986. A geologic tour of Wyoming from Laramie to Lander, Jackson and Rock Springs. Public Information Circular No. 27. 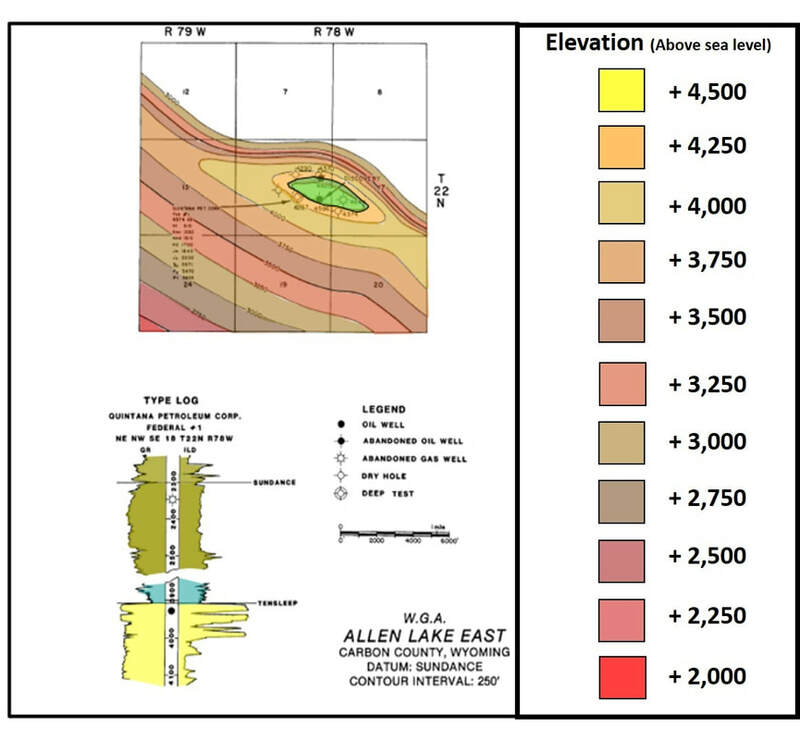 Laramie, WY: Wyoming State Geologic Survey, Fig. 5, p. 9, http://sales.wsgs.wyo.gov/geologic-tour-of-wyoming-from-laramie-to-lander-jackson-and-rock-springs-1986/. ​The Late Jurassic Morrison basin extends from Saskatchewan to New Mexico covering an area of 600,000 square miles. The basin began to form at the onset of subduction along the western margin of North America (185 million years ago). 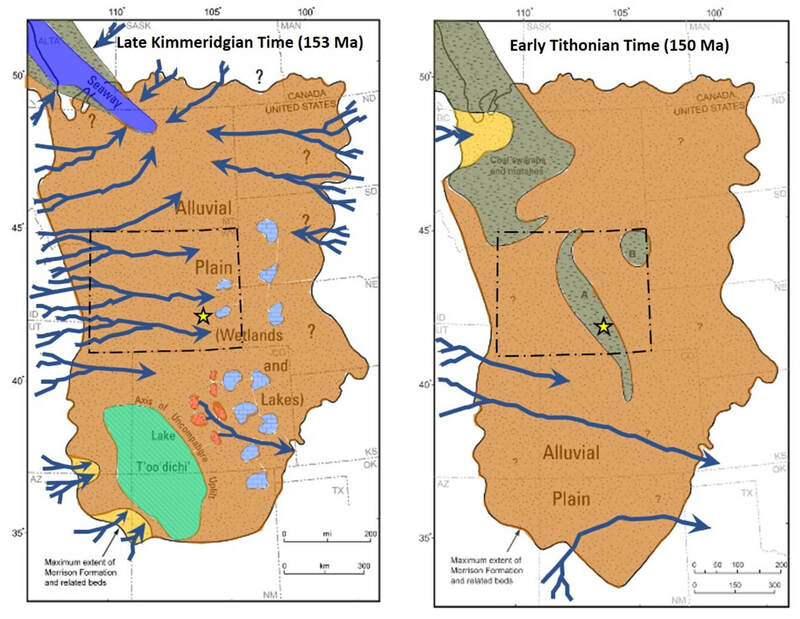 Sediments were first supplied by the Elko Highlands during the Nevada Orogeny (156 -145 million years ago) on the eastern border of Nevada and Utah. Stepping back into the Late Jurassic world presents a Wyoming far different than today. A vast alluvial plain emerged from the withdrawing Sundance Seaway with a relatively flat flood plain topography with thriving conifers, ginkgos, and cycads. Crocodiles and turtles congregated along the streams while pterosaurs soared overhead. Laramide tectonism (80-55 million years ago) will not reach this area for at least another 70 million years. The Jurassic Morrison basin with selected Dinosaur sites from Morrison and equivalent rocks. Abbreviations: CS: CedarosaurousSite, CLDQ: Cleveland-Lloyd Dinosaur Quarry, CB: Como Bluff Quarries; DMDQ: Dry Mesa Dinosaur Quarry, DNM: Dinosaur National Monument, H: Howe Quarries, SI: Something Interesting Quarry, and SS: SeismosaurusSite. ​Image: After Turner, C.E. and Peterson, F., 2004, Reconstruction of the Upper Jurassic Morrison Formation extinct ecosystem – a synthesis: Sedimentary Geology 167, Fig.1, p. 312, Fig. 7, p.336, Fig.8, p.338, Fig. 9, p. 340, and Fig. 19, p. 342; https://www.sciencedirect.com/science/article/pii/S0037073804000120. Paleogeography of Morrison Basin during the Late Jurassic Stages. Como Bluff Location shown by yellow star. Image: After Turner, C.E. 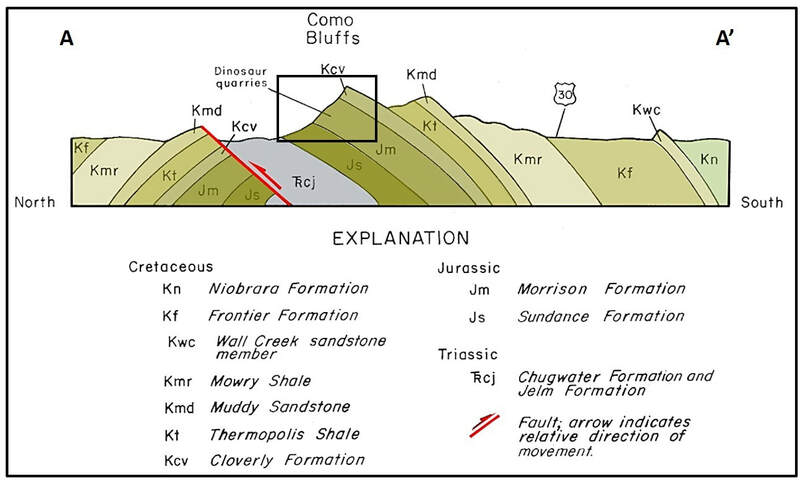 and Peterson, F., 2004, Reconstruction of the Upper Jurassic Morrison Formation extinct ecosystem – a synthesis: Sedimentary Geology 167, Fig.1, p. 312, Fig. 7, p.336, Fig.8, p.338, Fig. 9, p. 340, and Fig. 19, p. 342; https://www.sciencedirect.com/science/article/pii/S0037073804000120. Stratigraphic section of Jurassic rocks exposed at Como Bluff. Closeup image of area in rectangle on geologic cross section through Como Bluff Anticline. Morrison stratigraphic column from Como Bluff. Accommodation rate refers to the development of space for the deposition of sediments. Accommodation space is the combined product of sea level, sea floor (tectonics), and changes in rate of sedimentation. Expanded view of some of the many dinosaur quarries (at least 22) along Como Bluff Ridge (location shown by ellipse on Como Bluff area image and geologic map). Note looping meanders of Rock Creek and Medicine Bow River. Image: Google Earth; Data: National Registry of Historic Places Nomination Form, 1973; https://npgallery.nps.gov/AssetDetail/NRIS/73001925; Ostrom, J.H. and McIntosh, J.S., 1966, Marsh’s Dinosaurs: The Collection from Como Bluff, Fig. 3, opposite p. 10. ​Coal was mined for the railroad at Carbon (Dodge’s route coal target) located nine and a half miles west of Medicine Bow, Wyoming. Union Pacific operated seven underground mines from 1868 to 1902 with a total production of 4,680,000 tons of coal. The Hanna mines to the west opened in 1890. Carbon and Hanna coal field about 9.5 southwest and 19 miles west of Medicine Bow respectfully. Towns shown by dots, active (red), abandoned (green). 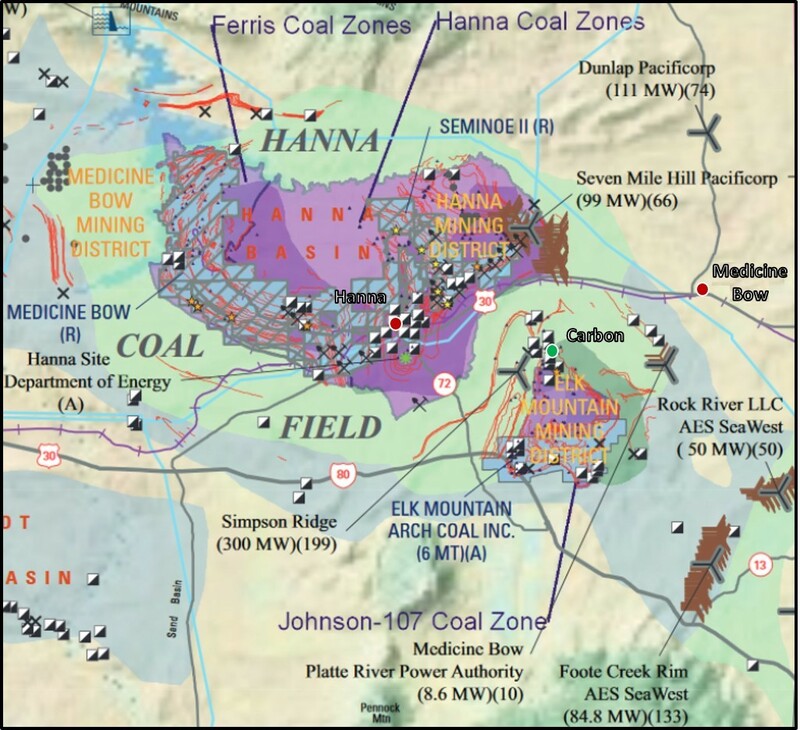 Image: After Biewick, L.R.H., and Jones, N.R., 2012, Energy map of southwestern Wyoming, Part A—Coal and wind: U.S. Geological Survey Data Series 683, Plate 1; https://pubs.usgs.gov/ds/683/contents/Plates/Plate1_WLCI_CoalWindMap.pdf. 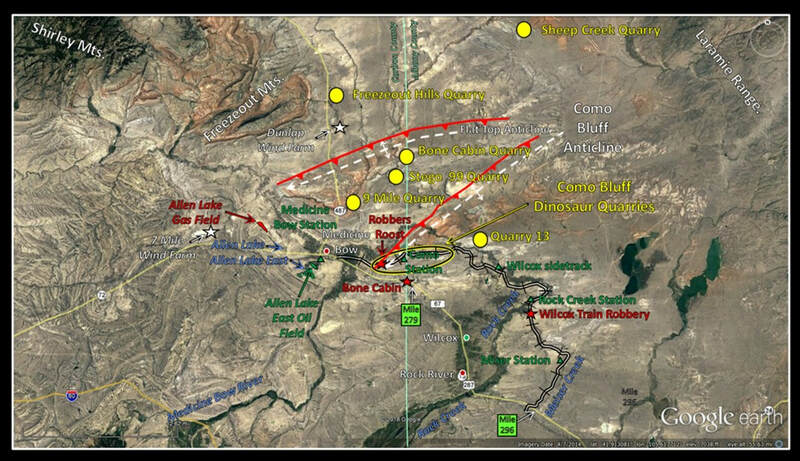 ​There are two hydrocarbon fields located to the west of Medicine Bow (red and green polygons on first image). Allen Lake field produced gas from Lower Cretaceous Muddy and Cloverly Formations, and Upper Jurassic Morrison and Sundance Formations. The field was discovered in 1919 and abandoned in 1944 with a cumulative production of 1,768,000 MCFG. The Allen Lake East oil field produces gas from the Upper Jurassic Sundance Formation and oil from the Pennsylvanian Tensleep Formation. The field was discovered in 1973 with a cumulative Jurassic gas of 5,514 MCFG and Pennsylvanian oil of 641,874 BO. Como Bluff anticline was drilled for oil in 1918 but found only artesian water in the Casper Formation (flowed until 1934). PacifiCorp has installed two wind farm projects near Medicine Bow to generate clean, renewable energy for the area (locations shown on coal map). The Seven Mile Hill Farm is located nine mile west of town and began commercial operations in 2008. The Dunlap Farm is ten and one-half miles north of town and began commercial operations in 2010. Hydro Carbon fields near Medicine Bow, Wyoming. Top: Allen Lake; Bottom: Allen Lake East. Elevation key shown on right of both images. Image: After McCutcheon, T., 1983, Wyoming Geological Association SE Wyoming Oil and Gas Fields Symposium, Laramie, Hanna, and D-J Basins, 1984, p. 10 and 14. Twenty first century wind farms in the Medicine Bow area. Seven Mile Hill is located nine miles west of Medicine Bow and has a power output of 99 megawatts. Dunlap is located ten and a half miles north of Medicine Bow and has a power output of 111 megawatts. Image: Left: https://d32ogoqmya1dw8.cloudfront.net/images/NAGTWorkshops/energy09/wind_farm_scenic.jpg, Right: https://bloximages.chicago2.vip.townnews.com/trib.com/content/tncms/assets/v3/editorial/c/d5/cd5f4a34-29d1-5573-9429-13695416d32e/5903c6e14d369.image.jpg?resize=1200%2C800. Standing near the plunging nose of the Como Bluff Anticline looking at the landscape you can let your mind drift back through deep time when this area was much different. Subduction 185 million years ago created highlands along the western margin of North America. They shed vast amounts of Mesozoic sediments into the Sundance continental seaway. 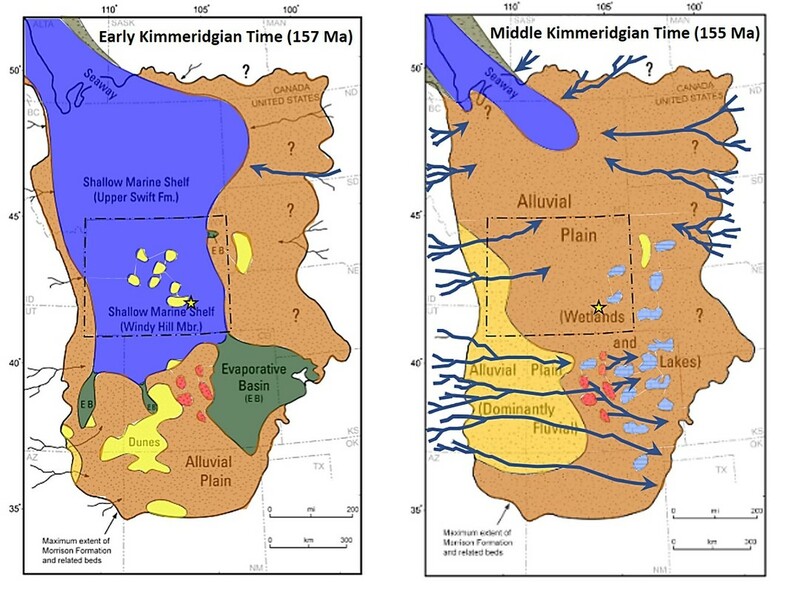 This was followed by the development of Morrison river systems that in turn were covered by a Cretaceous inland sea. Giant dinosaurs lived, died and were buried in the Jurassic landscape. Late Jurassic ecosystem 150 million years ago at Como Bluff. Image: After Mural by Robert F. Walters and Tess Kissinger, Carnegie Museum of Natural History. ​There are no bone quarries open to the public in this area and collecting of bones on federal land is prohibited. Most of the quarries are on private land that is off-limits.We know of no dinosaur quarry tours at this time. Our recommendation is to visit the historic Virginian Hotel in Medicine Bow, view the Bone Cabin, and see the Medicine Bow Museum.